These specifications apply to the PXIe-4139. Specifications are Warranted unless otherwise noted. Specifications are valid under the following conditions unless otherwise noted. 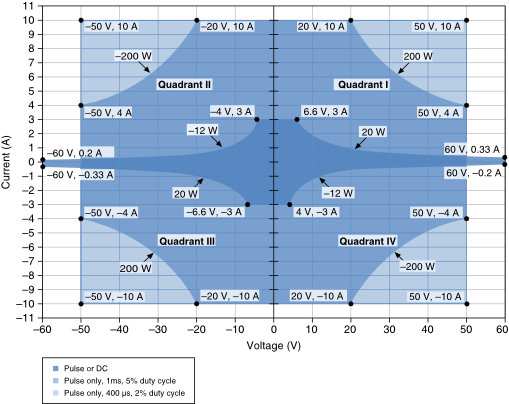 The following table and figure illustrate the voltage and the current source and sink ranges of the PXIe-4139. DC sourcing power is limited to 20 W, regardless of output voltage. Limit DC power sinking to 12 W. Additional derating applies to sinking power when operating at an ambient temperature of >45 °C. If the PXI Express chassis has multiple fan speed settings, set the fans to the highest setting. 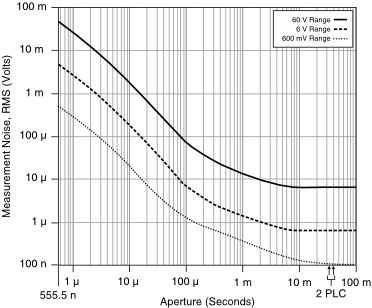 The following figures illustrate noise as a function of measurement aperture for the PXIe-4139. When the aperture time is set to 2 power-line cycles (PLCs), measurement noise differs slightly depending on whether the niDCPower Power Line Frequency property or NIDCPOWER_ATTR_POWER_LINE_FREQUENCY attribute is set to 50 Hz or 60 Hz. 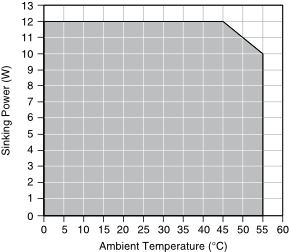 The following figure illustrates sinking power derating as a function of ambient temperature for the PXIe-4139. The following figures illustrate the effect of the transient response setting on the step response of the PXIe-4139 for different loads. Add (3 ppm of voltage range + 11 µV) per volt of HI lead drop plus 1 µV per volt of lead drop per Ω of corresponding sense lead resistance to voltage accuracy specifications. Exceeding the maximum lead drop per lead value may result in additional error. self-calibration within the last 24 hours. Therefore, the actual output will be within 370 pA of 900 nA. Therefore, the actual output will be within 238 pA of 900 nA. Therefore, the actual output will be within 158.2 µV of 500 mV. Therefore, the actual output will be within 266.2 pA of 900 nA. Do not connect to MAINs. Do not connect to signals or use for the measurements within CAT II, III, or IV. Take precautions to avoid electrical shock when operating this product at hazardous voltages. Isolation voltage ratings apply to the voltage measured between any channel pin and the chassis ground connector of the front panel. When operating channels in series or floating on top of external voltage references, ensure that no terminal exceeds this rating. This icon denotes a warning advising you to take precautions to avoid electrical shock. You can impair the protection provided by the PXIe-4139 if you use it in a manner not described in this document. If your device is hardware revision F or earlier, a snap-on ferrite bead is required to remain in EMC compliance. Refer to the PXIe-4139 Getting Started Guide included in your original shipping kit for information about this bead. To determine which revision of a device you have, open Measurement & Automation Explorer (MAX) and select the device in question. The hardware revision is displayed in the settings pane on the right-hand side. For UL and other safety certifications, refer to the product label or the Product Certifications and Declarations section. 1 The ambient temperature of a PXI system is defined as the temperature at the chassis fan inlet (air intake). 2 The PXIe-4139 does not support configurations involving voltage > |42.4 V| when the Sequence Step Delta Time Enabled property is set to TRUE. 3 Power limit defined by voltage measured between HI and LO terminals. 4 Accuracy is specified for no load output configurations. Refer to Load Regulation and Remote Sense sections for additional accuracy derating and conditions. 5 Tcal is the internal device temperature recorded by the PXIe-4139 at the completion of the last self-calibration. 6 Tcal is the internal device temperature recorded by the PXIe-4139 at the completion of the last self-calibration. 7 Tcal is the internal device temperature recorded by the PXIe-4139 at the completion of the last self-calibration. 8 Extended range pulse currents fall outside DC range limits. In-range pulse currents fall within DC range limits. 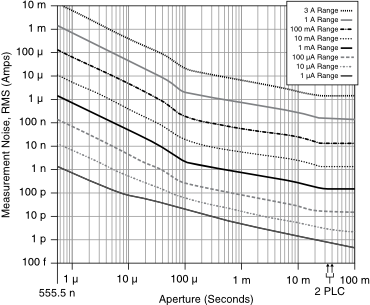 In-range pulses are not subject to extended range pulsing limitations. 9 Pulse on time is measured from the start of the leading edge to the start of the trailing edge. 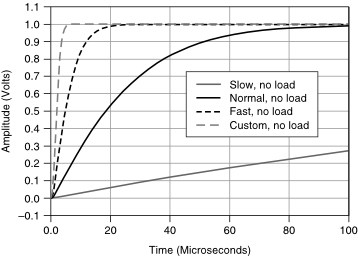 10 Measured as the time to settle to within 0.1% of step amplitude, device configured for fast transient response. 11 Current limit set to ≥50 μA and ≥50% of the selected current limit range. 12 Current limit set to ≥20 μA and ≥20% of selected current limit range. 13 Voltage limit set to ≥2 V, resistive load set to 1 V/selected current range. 14 When sourcing while measuring, both the niDCPower Source Delay and niDCPower Aperture Time properties affect the sampling rate. 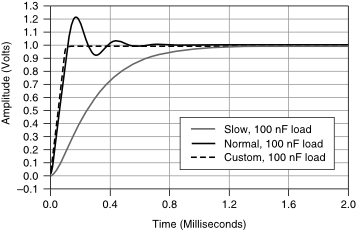 When taking a measure record, only the niDCPower Aperture Time property affects the sampling rate. 15 As the source delay is adjusted or if advanced sequencing is used, maximum source rates vary. Limited to 80,000 updates/s when the Sequence Step Delta Time Enabled property is set to TRUE. 16 Pulse on time is measured from the start of the leading edge to the start of the trailing edge. 17 Pulses fall inside DC limits. Pulse off time is measured from the start of the trailing edge to the start of a subsequent leading edge. 18 Specifications listed in examples are for demonstration purposes only and do not necessarily reflect specifications for this device. 19 Tcal is the internal device temperature recorded by the PXIe-4139 at the completion of the last self-calibration. 20 Pulse widths and logic levels are compliant with PXI Express Hardware Specification Revision 1.0 ECN 1. 21 Input triggers can be re-exported. 22 Verified with a 5-second dielectric withstand test.